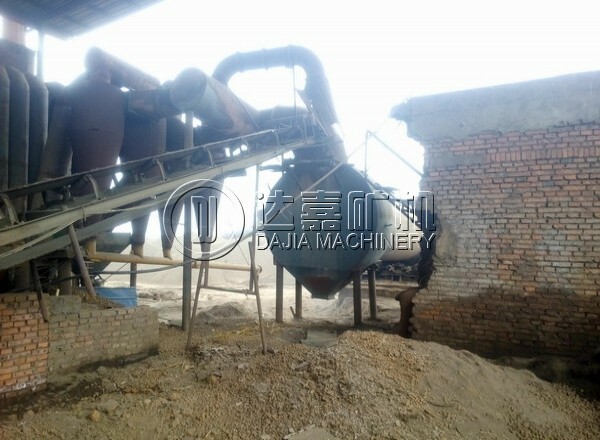 the ore is fed into the semi autogenous grinding (SAG)ball mill (4) along with water and steel balls. The grinding process reduces the rock to a slurry. l balls and the rock itself. In order to ensure that the rock is ground finely enough the ball mill has a trommel screen (5), which acts like a large sieve. The oversize rock (SCATS) is caught by the trommel, along with the worn hardened steel balls. This material is fed past a magnet (12) to separate out the steel balls. The oversize rock passes through the cone crusher (13), prior to passing once again into the ball mill (4) for further grinding. The slurry that is fine enough passes through the trommel to a sump (6) and then to a primary hydrocyclone (7). This hydrocyclone classifies the ground rock particles according to size – using centrifugal and gravitational forces to split the fine particles from the coarse particles. The fine particles are pumped via a sump (8) to a secondary hydrocyclone (9), and the larger particles return to the ball mill (4) for further grinding. The secondary hydrocyclone (9) further classifies the slurry, with the coarse particles being directed to the ball mill (14) and fine particles reporting to the trash screen (10). The ball mill is very similar to the ball mill, except it has a larger proportion of steel balls to assist in the grinding process. Following grinding in the ball mill, the material is returned via the sump (8) to the secondary hydrocyclone (9) for resizing. The trash screen (10) removes wood from the old mine workings that may have found its way into the processing circuit. The slurry that remains after this process has a very fine particle size. Typically, 80% of the ore particles are less than 70 microns in size (about the same consistency as fine beach sand). Such a fine particle size is required for gold liberation – the size required for the cyanide to be able to ‘see’ the gold in the leaching process. The remaining slurry passes through a pre-leach thickener (11), to remove some of the water. The recovered water is reused in the grinding circuit while the thickened slurry moves into the leaching circuit.